By using technology ranging from modified joypads to eye-control, Special Effect are finding a way for people to play to the very best of their abilities. But they are not just doing it for fun. By levelling the playing field, they are bringing families and friends together and having a profoundly positive impact on therapy, confidence and rehabilitation. 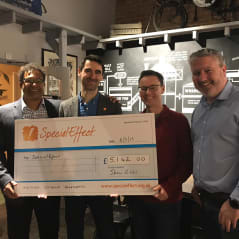 Amongst many activities that took place through 2018 to support Special Effect Shaw Gibbs took part in: the 2018 Twin Town Challenge and held: a GameBlast event for staff, a Charity Race Night at The Race Hut Oxford, a professionals quiz, a juniors quiz, a Christmas hamper draw and a Christmas Jumper day. "You’ve all done so amazingly well to hit this awesome total! I feel particularly privileged to receive this incredibly generous donation from such a highly regarded and well respected local team – not only a wonderful financial boost for our work in 2019 but an terrific morale boost too!"